How to See the Keywords People Use to Find Your Website? Want to see what keywords people are using to find your website? Google Search Console is the most reliable tool you can use to discover the search terms people use on Google to find your site. In WordPress, the MonsterInsights plugin helps you to connect your Search Console account with Google Analytics and shows you the keywords right inside your WordPress dashboard. 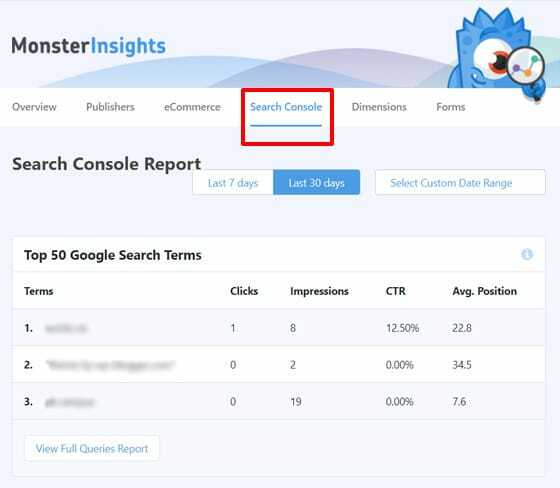 In this article, we’ll show you how to see the keywords people use to find your website in MonsterInsights reports as well as in the Search Console platform. Why Is It Important to Know the Keywords Your Site Is Already Ranking For? If you’re wondering why it’s important to know the keywords your site is already ranking for, you may be less aware of SEO (search engine optimization) than you should be. Keywords are vital when it comes to getting ranked on Google, and getting found by your audience. When you know what search terms are sending you most organic traffic from search engines, you’ll gain insight about your site’s performance on search engines. You can also check if your SEO efforts are going well or not, by comparing your targeted keywords with the actual keywords your site is ranking for. If the keywords you’ve set for your site match with the keywords used by your users in search engines, it’s a good indication that your SEO strategies are going well. If they don’t match, you can learn where your SEO settings went wrong. Hence, you can make the necessary adjustments and make your site more SEO-friendly. Or, you can use the new keywords as fresh content ideas for your blog. By creating useful content around a keyword your site is already getting an average rank and traffic for, you can further boost your search engine rankings and organic traffic. Google Search Console is the best platform to view the search terms / queries people are using on Google to find your website. It’s an online marketing tool offered by Google that allows you to monitor and view your site’s performance in Google search results. In addition, it also helps you to fix crawl issues. The first method is using the MonsterInsights Google Analytics plugin. This plugin helps you to track your website traffic, users’ interactions on your site, and shows you easy-to-understand reports. 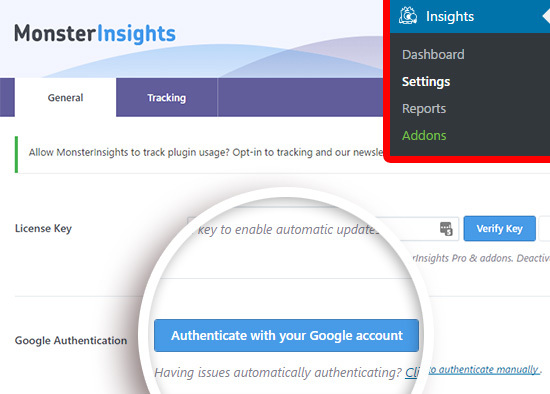 To get Search Console reports in your WordPress dashboard, you’ll have to install MonsterInsights on your site and authenticate it with your Google Analytics account. Please make sure that you purchase at least the Plus plan because Search Console report isn’t available on the Basic plan. Then, you’ll have to add and verify your site on Google search console. You can do that with your Google Analytics account. If you want detailed instructions, here’s our complete guide on how to verify your site in Google Search Console with Google Analytics. 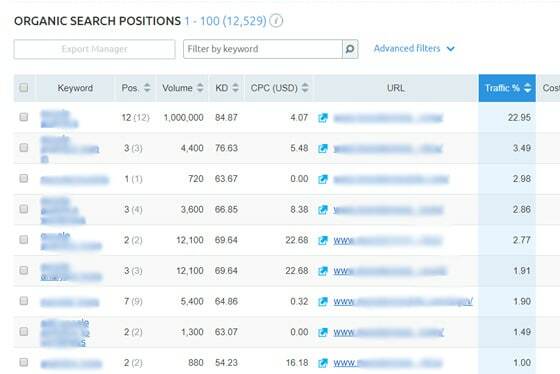 Once you’ve added your site on Search Console, you can view your site’s top 50 search terms in your MonsterInsights reports. To view the Search Console report, you’ll need to navigate to Insights » Reports from your WordPress dashboard. There, you’ll see your site’s analytics overview report. 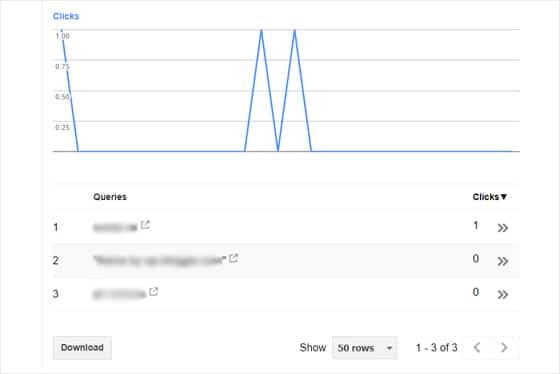 Go to the Search Console tab in the top of the report. From there, you’ll see the top 50 search terms for your website. As you can see in the screenshot above, you’ll see the number of clicks, impressions, click-through-rate, and average position for each of the keywords. 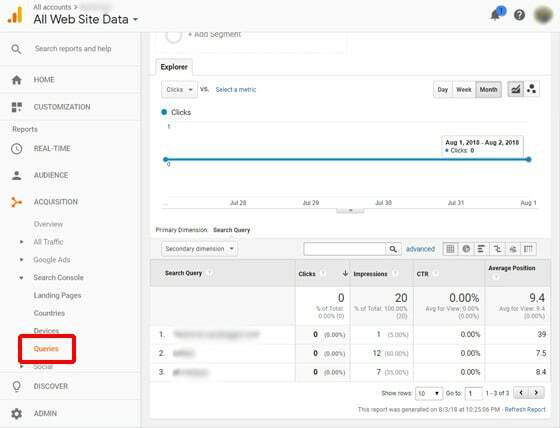 If you click View Full Queries Report button at the bottom of the report, it’ll take you to Google Analytics’ website and open Analytics » Acquisition » Search Console » Queries. This is the third method of the 3 indicated above. Now, let’s see how to view search engine keywords in Google Search Console account. First, you’ll need to go to the Search Console website and sign in with your account. Then, you’ll see your websites in the Search Console home page. Select the website you want to view. Then, your Search Console Dashboard will open. 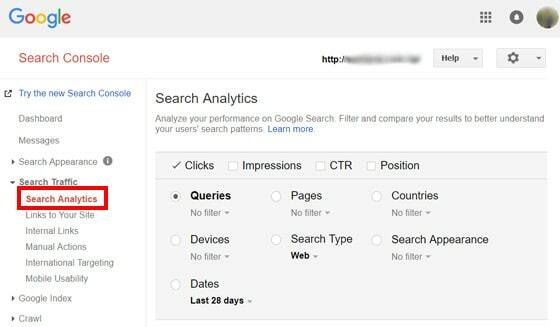 Next, you’ll need to navigate to Search Traffic » Search Analysis. Scroll down and you’ll see the search keywords people use to find your website. That’s how you can see your site’s Google search keywords. Of the 3 methods, MonsterInsights is the winner when it comes to convenience as it shows the data directly inside your WordPress dashboard. Plus, the format of the reports is also much more comprehensive. While Google Search Console is a free service for your site’s search analytics, you can also use a paid SEO tool like SEMRush to view the keywords. Using this tool, you can perform organic research, paid advertising research, keyword research, and in-depth competition analysis for improving your site’s SEO. To get started, simply go to SEMRush website, enter your website URL, and click Start now. It’ll show Overview report for your site including organic search, paid search, backlinks, etc. Now, you’ll need to go to Organic Research menu. Once there, you’ll see your organic keywords along with your search position on Google’s results. We hope this article helped you to learn how to see the keywords people use to find your website. You might also want to check out our guide on 4 ways to boost your SEO rankings with Google Analytics.